CSUN students work at the San Fernando Observatory at its previous location in Sylmar, California. When The Aerospace Corporation was looking for a place to build a solar observatory in the 1960s for their solar research in support of NASA’s manned space program, they needed a location where an unstable atmosphere wouldn’t impede their work. In 1969 they chose the San Fernando Valley — a place where the air is so stable it leads to the area’s smog problem — in which to build the San Fernando Observatory (SFO); specifically Sylmar, the area between Van Nuys and Santa Clarita. In early 2016, the Observatory was downsized and relocated to the California State University, Northridge (CSUN) campus, where students and faculty will find it easier to access the facility to continue monitoring the Sun’s activity as it nourishes the Earth. What happened between 1969 and 2016 to bring about this move? In 1971, the San Fernando Observatory suffered extensive damage in the Sylmar earthquake, requiring significant repairs. Aerospace had last used it in support of NASA’s Skylab mission in 1973-74, after which they found its priorities changing. At that point, Aerospace donated the facility to CSUN. Because the site was located on land owned by the Los Angeles Department of Water and Power (LADWP), CSUN struck an agreement with the utility company allowing students and faculty access to the facility. In 2013, however, the LADWP needed their land back, prompting the need to find a new home for CSUN’s long-running research program. The decision was made to move to a new site on campus. Thanks to gifts from The Ralph M. Parsons Foundation, Drs. Barbara Kulik and John K. Lawrence, Dr. and Mrs. Gary Chapman, the National Science Foundation and other sources, it was relocated to a newly constructed observatory building in the orange grove on the southeast corner of campus. Abandoning the program would have ended 40 years of the University’s solar astronomy work-- most importantly the ongoing solar photometry program that has involved student and faculty in the study of solar variability for more than 30 years! Since CSUN began operating the SFO in 1976, hundreds of undergraduate and graduate students, along with faculty mentors, have been involved in collecting solar data. The Sun’s behavior is still not fully understood, and it remains unpredictable, yet it is the most important influence on the life and climate of Earth. Solar activity, such as sunspots and flares, results in energy fluctuations that have significant effects on our climate and on the space environment of orbiting satellites and manned spacecraft. To get a better understanding of solar changes, CSUN combines information from its ground-based images with NASA and the European Space Agency (ESA) spacecraft measurements of solar-radiation output. The amount of energy striking the Earth’s upper atmosphere, known as the Total Solar Irradiance (TSI), varies by about 0.1 percent over each 11-year solar cycle, in which sunspots become more, and then less, numerous. Bright magnetic features, called faculae, also vary in approximate sync with sunspots. Using the SFO photometric images, researchers can precisely measure the darkness of sunspots and the brightness of faculae, to determine their contributions to energy changes. They then utilize straightforward indices derived from these measurements to model the satellite TSI with a high degree of accuracy. Maintaining the Solar Observatory program was vital because it allows our astrophysicists to continue tracking solar changes over time, a crucial component in the effort to study climate change and protect human, animal, and plant populations worldwide. The SFO’s new location made perfect sense since it is close to the Donald E. Bianchi Planetarium and the stellar (night time) observatory. The area is relatively free of physical obstructions, such as buildings, that could block solar observation. Most notably, its addition creates an entire astronomy complex on the CSUN campus-- the only comprehensive astronomy network in the entire CSU system. One big advantage to moving the Observatory to campus is that it gives students easier access to participation in observational solar research. 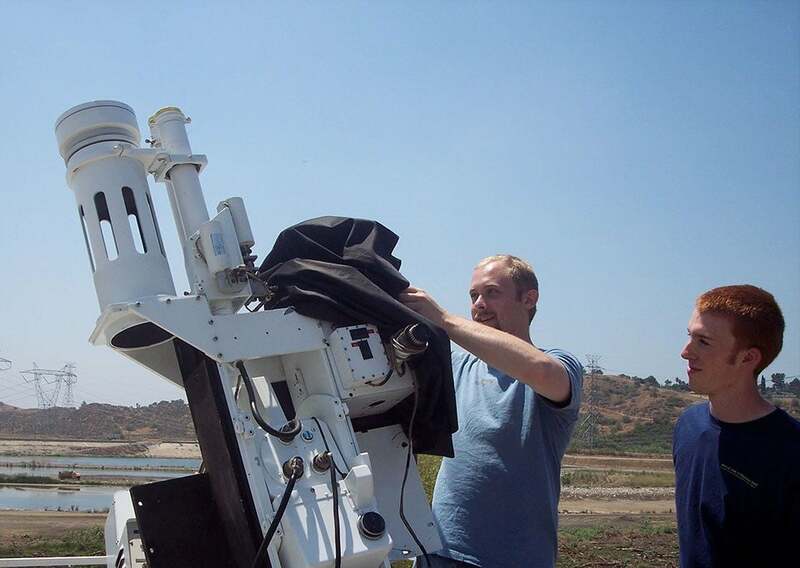 Students receive instruction in solar astronomy and hands-on training in operating observatory systems and instruments, including telescopes, computer systems, software tools, and data analysis. The data they collect is used by researchers around the world. The dedication of the new Solar Observatory will take place on March 15, 2016 with NASA astronaut James F. Reilly, II, Ph.D., serving as Honorary Chair. There is much to celebrate as this new facility allows CSUN researchers and students to continue the work of tracking solar changes over time, thereby contributing to our understanding of the Sun’s behavior and to the international study of climate change and the preservation of the planet.